Formerly known as Siam, Thailand today is a thriving Southeastern nation. Home to over sixty-eight million people, Thailand is now one of the world's most beloved tourist destinations. Visitors from all over the world come to this part of the globe to enjoy the region's mild climate, spectacular cuisine, beautiful beaches and vibrant culture. Travelers to Thailand will find easy access to incredible ancient historical sites, welcoming warm coastal waters with miles of pristine beaches and friendly locals. One part of Thailand that has attracted a great deal of notice and many travelers in recent years is Phang Nga Town. Charming Phang Nga Town makes an ideal stop as part of an overall trip to Southeast Asia or as a destination in itself when exploring the region of Phang Nga. Planning a trip here to this small town is a great way to meet locals and experience authentic Thai life and culture firsthand. It's also inexpensive, relaxed and far less touristy than many nearby parts of the area. 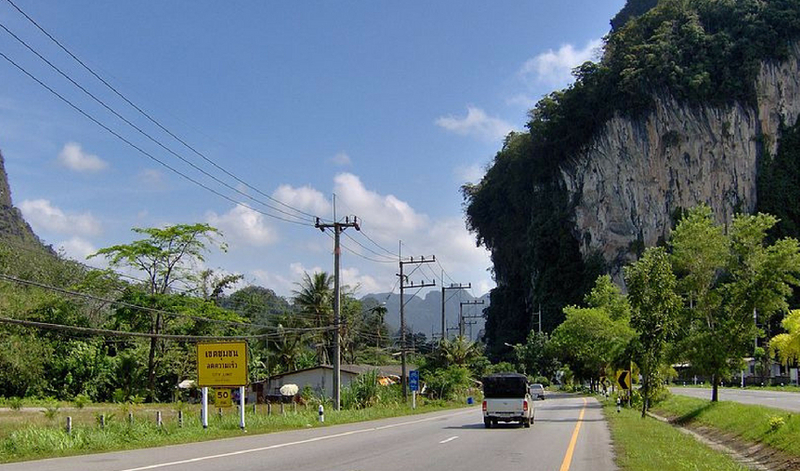 Phang Nga Town can be reached in many ways that include two airports, buses and cars. Many travelers first land in the capital city of Bangkok. Hundreds of direct flights fly there every single day from all over the world. Another option to get to this part of Thailand is the Phuket International Airport. Millions of passengers pass through this airport each year via many flights both from Bangkok and other parts of the world. Travelers from Bangkok will need to get to the Phang Nga Town area via car or a bus. Drivers should expect this trip to take at least twelve hours from the Bangkok, making it an easy place to visit as part of a longer trip to Southeast Asia. Highway No. 4 brings drivers into the heart of town directly from the capital city. Those traveling from Phuket International Airport can expect their drive to be about an hour or less. Several bus routes go from varied parts of Thailand to a station about three kilometers from the center of town. There's a VIP bus and two standard buses. There are taxis that bring travelers from the bus station to their ultimate destination. Travelers can get to a local boat dock by the sea that's about nine kilometers south of the community. One of the many great pleasures of visiting Thailand is the region's world renowned food. In recent years, Thai food has becoming increasingly popular in other parts of globe. Thais love to use local ingredients to make delicate dishes that appeal to all of the senses. Dishes such as pad Thai are particularly popular and served here as well. Phang Nga Town is no exception. Dozens of restaurants line the main street. This makes it easy to grab a quick breakfast, a leisurely lunch or spend time enjoying a formal dinner for everyone in your party. Vegetarian food is widely available at several restaurants and cafes. People who want to make use of area products will find several markets in the center of town where they can get access to local products of all kinds and then try their own versions in their hotel room. There's also many places to splurge on a special, romantic meal for two. Phang Nga Town is home to many glorious attractions. One of the most popular is that of Ao Phang-nga National Park. This forty thousand square kilometer national park is a must see. More than forty islands dot the park, making it possible for any traveler to find one they really love. Tiny islands with nearly private beaches make an ideal day trip from the mainland or as part of a larger trip. Island hopping is easy with help from local boat owners. Dozens of local boat owners offer trips that can be personalized to the user's preferences or as part of a larger group of people. Canoes are also available for a more intimate look at the sea and sky from just a few meters above the waters. The Andaman sea is gentle and calm with waves that rarely go above a single meter. This makes the national park a wonderful place for families with children or just those who want to relax in the gentle sea. While November through April makes a fabulous season to visit as this is when the rains retreat, the warm waters are an ideal place to visit all year long. Head underwater for a true treat. Not long ago, this part of the country was once underwater. Today, it shows in mangroves teeming with wildlife and islands that can only be accessed at low tide. A visit to the caves here should be at the top of any visitor's list. Ancient rock art depicts local scenery from thousands of years ago. Take a two or three hour pre-arranged tour of the caves for an easy way to see the caves and the art. Translators can help people make sense of what they're seeing. A walk on one of the many beaches also offers a chance for a picnic lunch in one of the region's most scenic spaces. Travelers should make full use of all the areas around the bay. Wonderful sites await at every turn. A good place to start is Tham Lot. This limestone grotto makes the perfect way to get in close touch with nature and see how the region was formed so many years ago. It makes a popular destination for canoes from the mainland. About ten kilometers away lies two hills. The magnificent cliffs of Khao Phingkan and Ko Tapu are at the top of any traveler's regional bucket list. 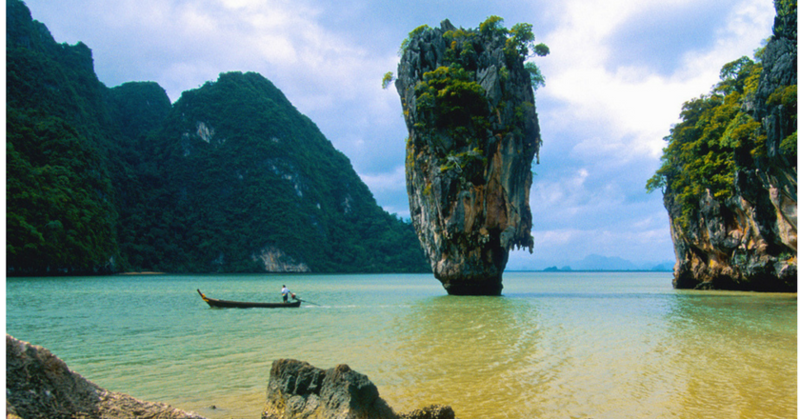 Part of Ao Phang-nga, they were one of the many locations chosen for the James Bond movie, The Man With the Golden Gun. Since filming in the 1970's, the two are a highly popular regional tourist destination. The iconic islands sit atop a marvelous world. Underneath lies water rich in life. There are about two dozen species of fish, many native reptiles and lots of other creatures including crabs, manta rays and many amphibians. Beaches and places selling local food and crafts also make it easy to spend an entire day right here. Fish are plentiful in the local waters. In order to take advantage of this fact, whole villages moved off shore. Many of these historic villages still exist today. Ko Panyi is one such village. Home to several hundred Muslim families, the village consists of houses on stilts. Their ancestors were not allowed on land so they settled here from Indonesia. They welcome tourists happy to explore this area and interact with locals directly. Many local tours make stop here for a nice lunch. It's a great place to find many local restaurants serving freshly caught seafood with an authentic Thai touch. Locals also sell crafts and other art that make the perfect thing to bring home. One of the many joys of life here is just how easy it is to find a retreat and yet still have all the comforts of civilization at every turn. This part of the world offers lots of choices when it comes to getting away from it all. Many regional islands have a wonderful mix of places to see, things to do and beauty. Two of the most lovely are found in Ko Khai. This tiny island is a seductive mix of blue sky, lush greenery and welcoming beaches. Just offshore lie about a dozen species of fish in brightly amazing colors. Step into the water and go snorkeling for a glimpse of the bounty of the ocean. While the island is popular with locals, there are numerous isolated coves. During the day, stretch out on the shore and have lunch at a local restaurant. At night, the starts come out one by one and then blaze with light. The island offers a classic taste of local Thai cuisine and a chance to appreciate the view across the bay from the inviting shore. Get away from the heat with a visit to this cave. Phung Chang Cave is easy to access with a guide. Let them bring you to this regional treat during the heat of the day. Located deep inside mountain of Kao Chang, Phung Chang is also known as the Elephant's Belly Cave. Enter the cave by the Wat Pra Paht Pra Jim Temple. Make sure you have flip flops or other stable footwear as it is flooded. A guide can show you the numerous wildlife that live here including the world's smallest bat. It's a great change of pace from days on beaches and a chance to understand the culture at the same time. When you leave the cave, head to the beautiful, isolated Sa Nang Manora waterfall. It's a refreshing chance to relax in the cool waters with family and friends. Another perfect place to splash is the Ton Pariwat waterfall. Hidden in a tropical rain forest, the Pariwat makes an excellent stop off. You'll need to walk here but the walk is well worth it. The pond teems with fish. Cold water welcomes people in the hot climate. Take some time and hop in. It's safe and refreshing as well as pleasingly relaxing. There's a series of steps that will bring you right there. When you're not exploring the local caves or hitting the regional national parks, take full advantage of the many water enjoyment opportunities in the area. Go swimming in the warm waters along the shore. Private boats can be rented for a small fee that let you water ski to your heart's content. Inland, whitewater rafting is possible along with ziplining. The local waters offer a challenge for those who love boating and want to spend hours on a fast river. Safety measures make it easy to relax and enjoy the ride and the fantastic scenery at the same time. People who have never dived before can also learn to dive with the help of qualified guides. Even a short distance underwater opens up a world of color and light. The region's many creatures can be seen easily from many spots in the area. A single day reveals a nearly hidden aspect of the shore and makes it possible to fully enjoy the area. Anyone who is going to plan a trip to Phang Nga Town should make sure they have all have all plans for their personal trip nailed down before they leave. Transportation options make it possible to get here and see other sites in Thailand as well as the entire greater Southeastern Asia area. Accommodations range from simple stays just right for any budget to luxurious Phang Nga resorts with upscale amenities. Book at least a month in advance. The high season is roughly during the dry time when the rains are less common. If you are planning to come here during that time, keep in mind that it is best to allow even more time to get the ideal trip. Renting a car is also a good idea as it allows the traveler the option to see as much as the area as possible during their entire stay. Ample sunscreen is a must in this climate as are several changes of clothing. Bring good hiking shoes that have enough support for the region's mountainous areas. A pair of shoes suited for the beach is also important for the beachcomber. Proper attention to details like the right clothing, comfortable, shoes and the best possible accommodations for all of their family members allows any traveler to have even more fun on their trip to relaxing, pleasing Phang Nga Town.